James Ennis brought his game to the court Tuesday night, and he won't let us forget it. 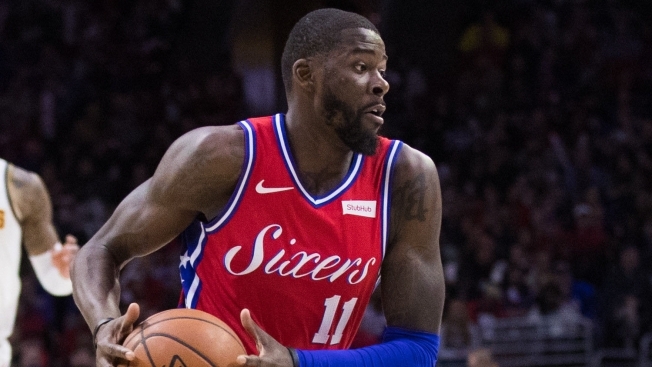 With Jimmy Butler out for rest, James Ennis started in the Sixers' 106-99 win over the Cavs in a game that seemed like a layup for the Sixers, but ended up being a nail-biter until the last few seconds. Scoring 12 points on 6-of-7 shooting, while adding seven rebounds, two assists and a block in 22 minutes, Ennis is starting to get comfortable in his red and blue jersey. "He was our bell-ringer tonight," Brett Brown said. "I thought he kept the game in from of him a lot - better than some of our perimeter defensive guys." Some of his teammates learned what Ennis can do. "I didn't know he was as good of an offensive rebounder as he is and he's made some spectacular plays at the rim, hitting the glass," JJ Redick said. With an opportunity to stand in the limelight, that's just what he did. His quiet athleticism and ability to blend in with some of the best players in the league proved to be essential in securing the win. As for last night's performance, Ennis is now clearly winning "the tournament" against Jonathan Simmons for minutes. Back when Ennis got traded from the Rockets for just about nothing, Simmons seemed to be the front runner in Brown's rotation. He had trouble finding his rhythm coming from Houston where he was in an offensive system predicated on hunting for threes. Brown's pace-and-space system emphasizes more player and ball movement. If Ennis wanted to make an impact, he had to redefine and reconnect with his own individual skill set. But it turns out that Ennis eventually found his groove and is just what the Sixers need heading into the stretch run - an athletic bench player who can be counted on to get the job done when the opportunity calls. "He's settling in comfortably," Joel Embiid said. "We're going to need him for the rest of the regular season and the playoffs." That's all Ennis could want. No longer stuck in the shadows on the Sixers' bench, Ennis could be a key reserve down the stretch.